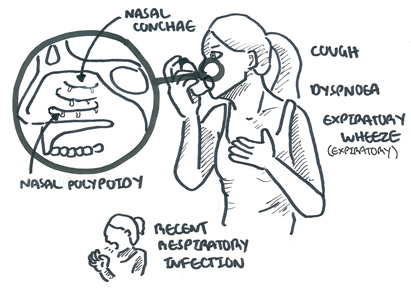 Summary Clinical features of asthma such as dyspnoea, chest tightness and wheezing can mimic other respiratory conditions. It is important to take a careful history and examination and ideally demonstrate reversible airflow obstruction. 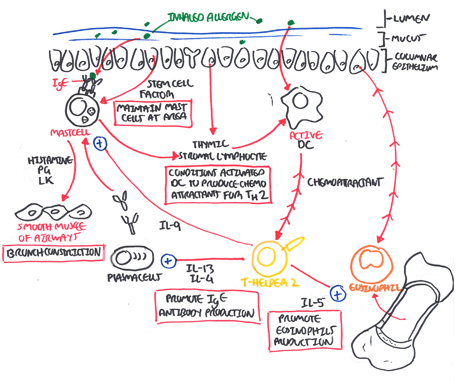 Other clinical features of asthma arise during periods of bronchoconstriction (ie. exercise, smoking, stress, cold air). Exacerbation of asthma confounds the breathing difficulty, cough and wheeze in patients. 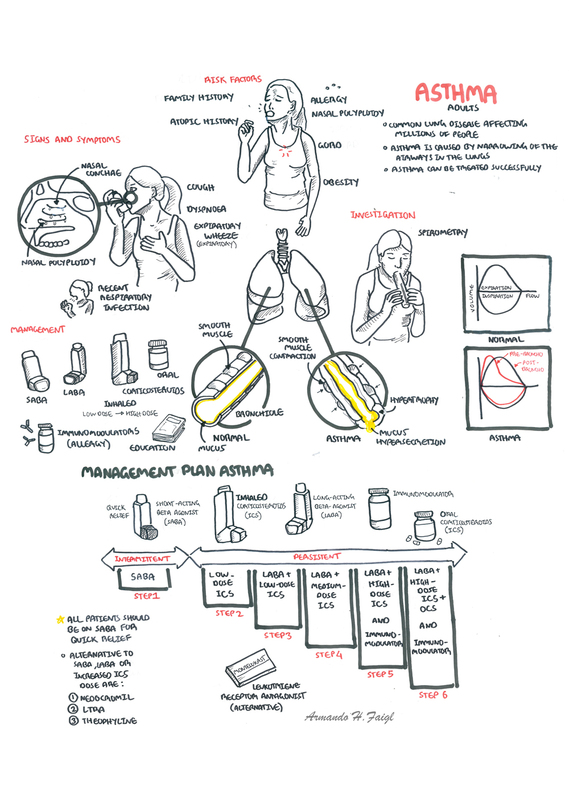 Overview Asthma is one of the most common respiratory diseases. It is generally accepted that asthma is associated with affluent Westernised lifestyle, with the prevalence being higher in more developed countries. The prevalence increasing significantly since 1960. Asthma is more common in children than adults and affects boys more than girls, with most patients being symptomatic by age 3 years. Between 30-80% of children become asymptomatic around the time of puberty. Asthma: Condition of bronchial hyperactivity and smooth muscle hypertrophy leading to a chronic inflammatory condition of the airways associated with widespread bronchospasm that is reversible. Acute cough: Condition for less than 3 weeks, most commonly caused by acute upper respiratory infection but also may be caused by congestive heart failure, pneumonia, and pulmonary embolism. Chronic cough: Condition for longer than 3 to 8 weeks (case definitions vary). Smoker – chronic obstructive pulmonary disease. Nonsmoker with a normal chest radiograph and not taking an ACE inhibitor, it may be due to postnasal drip, gastroesophageal reflux disease (GERD), or asthma. Asthma is a chronic airway inflammation disorder due to complex interactions between inflammatory cells, mediators and airway cells. Risk Factors for asthma include having an atopic history (rhinitus, ezcema), family history and having multiple allergies (ie. dust/pollen). For children developing viral infection is a risk. Clinical Presentation Patients may present because of an asthma exacerbation due to a recent respiratory infection. This is often the case for children. 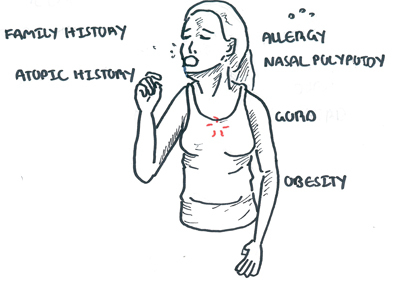 Asthma is clinically characterised by having a expiratory wheeze. Some patients may have a completely normal examination and a lung spirometry has to be performed +/- exercising to check for exercise induced asthma. Remember The three most common causes of chronic cough in immunocompetent nonsmokers who are not taking ACE inhibitors are postnasal drip, asthma, and gastroesophageal reflux disease. 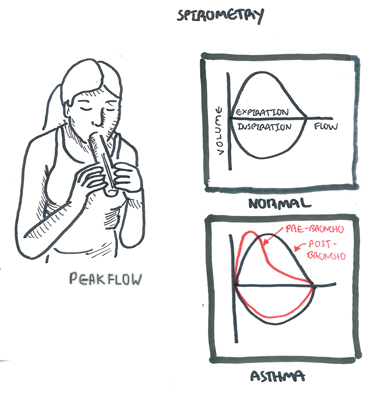 Spirometry – shows <80 FEV/FVC ratio. Broncho-reversibility testing FEV >12% (or 200ml). Pathology Asthma is an inflammatory condition of the airways. Postmortem studies reveal hyperinflated lungs, mucus plugging and small areas of pulmonary atelectasis are also observed. Microscopically, there is mucus hypersecretion, goblet cell hyperplasia, infiltration of mast cells and eosinophils and smooth muscle hypertrophy and proliferation. Non-pharmacological interventions – Education and developing a asthma action plan is critical for preventing emergency admission and for controlling asthma. Remember Treatment of asthma is a stepwise process based on frequency of symptoms and response to prescribed medications. 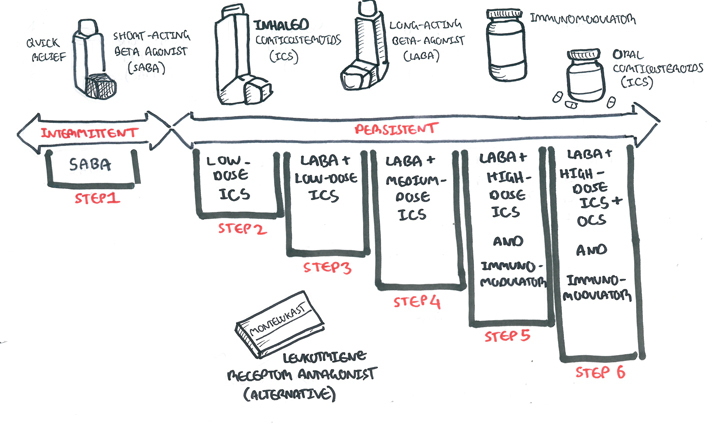 Pharmacological There are guidelines used for the management of asthma. These guidelines are divided into 6 steps, 6 being the most severe. 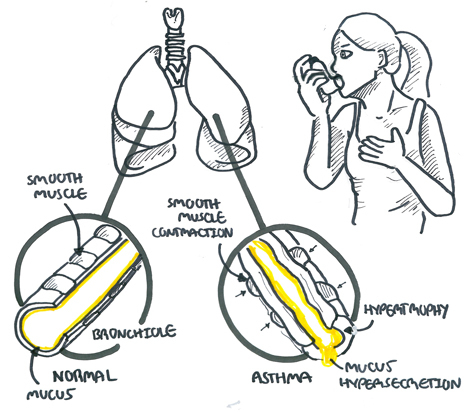 Sometimes people with asthma can have exacerbations. It can be mild, moderate, severe or life threatening. During an exacerbation if their SABA (ventolin) does not help people present to emergency for help. treat with oxygen, fluids, SABA and ICS.